Precision Plus Package: Premium Laser Cataract Surgery…Plus! As a leader in the field of cataract surgery for the last fifteen years, Dr. Rex Hamilton stays on the cutting-edge of the newest developments and technologies available to cataract surgeons. Dr. Hamilton began using lasers for cataract surgery in 2010, was the first faculty member at the Stein Eye Institute to implement laser cataract surgery and has trained numerous ophthalmic surgeons on the art and science of this amazing technology. Dr. Rex Hamilton is proud to offer the Precision Plus Package that takes advantage of laser and other advances, maximizing your outcome while minimizing the risks and side-effects. The package makes use of two amazing technologies: Femtosecond Laser Assisted Cataract Surgery (FLACS) and Intraoperative Aberrometry (ORA). 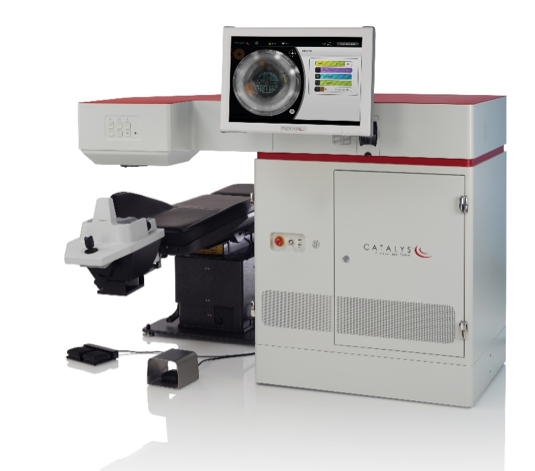 What is Femtosecond Laser Assisted Cataract Surgery (FLACS)? 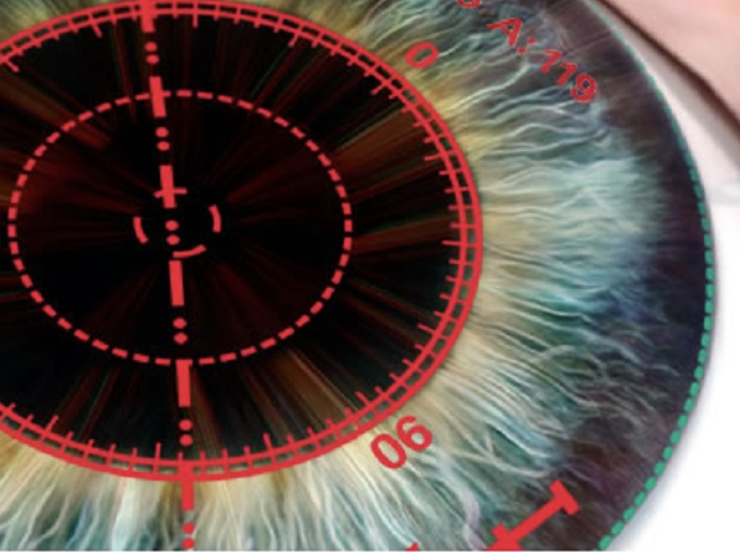 A FLACS system is a device that places very short duration pulses of laser energy onto exact, targeted locations within the eye to carry out certain steps of the premium cataract extraction procedure. The word “femtosecond” refers to a unit of time one millionth of one billionth of a second. These laser pulses can be arranged and patterned in a customized way to create a precisely shaped incision through transparent tissues such as the cornea and the cloudy lens (cataract) inside the eye. Prior to using the laser, the system collects high resolution images of the intricate, anatomic structures that make up the front portion of your eye. Then, based on these images, Dr. Rex Hamilton precisely defines the placement of the laser pulses to create incisions within various eye structures (e.g. cornea, cataract) without the use of physical surgical instruments. This improves the overall accuracy and safety of the procedure, increasing the chance of achieving the outcome you and Dr. Hamilton desire. How does using FLACS during the surgery benefit me? The cataract is a cloudiness of the lens which resides inside the eye. Incisions need to be made through the cornea (clear window on the front of the eye) to extract the cataract. When using FLACS, Dr. Hamilton precisely defines the dimensions and location of these laser incisions, using imaging guidance of your unique anatomy. This offers a higher level of consistency, leading to more predictable control of astigmatism than is afforded by manually created incisions using traditional techniques using a surgical blade. Residual astigmatism following surgery can lead to blurred vision and may require glasses to achieve the sharpest outcome. An exquisitely thin natural capsule surrounds the cataractous lens. A round opening in this capsule must be made on its front surface to allow for safe removal of the cataract. It is very important to maintain the integrity of this capsule since it will house the intraocular lens implant that will subsequently be implanted. For the first 10 years of his career, Dr. Hamilton performed thousands of these capsulotomy (or “capsulorhexis”) procedures in all types of eyes using a manual technique and is entirely comfortable in manually performing the capsulotomy procedure in any eye with any type of cataract. However, there is an added level of precision and reproducibility when using the FLACS system to perform the capsulotomy under imaging guidance. Having performed over one thousand FLACS procedures, Dr. Hamilton believes a FLACS created capsulotomy offers an added level of precision and reproducibility to the size, shape and location of the capsular opening. This translates to more predictable vision outcomes since a reproducible capsular opening leads to more consistent healing of the intraocular lens implant as it settles inside the capsular bag. If, during the first weeks to months of healing, the lens implant heals or “settles” into a slightly different position from one patient to the next, post-operative vision without glasses becomes less predictable, increasing the chance of needing glasses to see clearly. In other, less common situations, using FLACS to perform the capsulotomy can add a level of safety to the cataract surgery (e.g. very advanced “mature” or “white” cataracts). The phacoemulsification procedure utilizes vibrational energy to emulsify the cataract, allowing for its removal through a small incision. The more dense or “advanced” the cataract and the smaller the eye, the more of this vibrational energy is transmitted to the cornea, the clear window on the front of the eye. Through many years of experience with thousands of cases performed, Dr. Hamilton has optimized the complex settings on the phacoemulsification machine and the surgical tools utilized to minimize this “energy” deposition to the cornea. Nevertheless, some level of energy deposition is unavoidable. The more energy deposition that occurs, the higher the chance of blurred vision during the immediate post-operative period. When using FLACS under imaging guidance, Dr. Hamilton is able to precisely and safely divide up the cataractous lens into smaller pieces using the laser. This allows him to subsequently remove the cataract using even less energy deposition through his advanced, FLACS optimized phacoemulsification techniques and instrumentation. 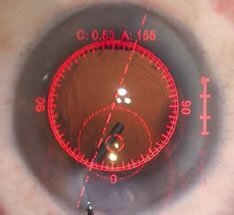 The vision on day one following surgery are typically sharper than they would otherwise be had FLACS not been utilized. Astigmatism means the cornea has a football shape where one direction is steeper and the opposite direction is flatter. Optically, this shape leads to distortion and blurring of vision at all distances. Dr. Hamilton takes detailed, three dimensional pictures of your cornea using the Galilei system during your initial cataract evaluation. He uses these pictures to identify the amount and orientation of your astigmatism. Then, during surgery, Dr. Hamilton uses the FLACS system to precisely place incisions (called astigmatic keratotomies) under imaging guidance, to treat the astigmatism. Through imaging guidance, these laser incisions are precise in their depth, width and location, based on your unique anatomy. The goal of these incisions is to round out the cornea, minimizing post-operative astigmatism and provide the best visual outcome. Dr. Hamilton has performed thousands of astigmatic keratotomies manually using a diamond blade but the depth, width and location of these manual incisions is not as precise as those placed using FLACS under imaging guidance. Once Dr. Hamilton has removed the cataract from your eye, he needs to decide on the power of the intraocular lens implant (IOL) that will be inserted into the eye, replacing the cataract. Dr. Hamilton is extremely skilled in the art of IOL power selection using advanced power calculations based on measurements done in the office prior to surgery. The anatomy of each individual eye is unique, however, leading to a chance that the IOL power selected may not be optimal. When Dr. Hamilton uses the laser for cataract surgery, he makes use of an additional tool to add a level of precision to the IOL power choice. 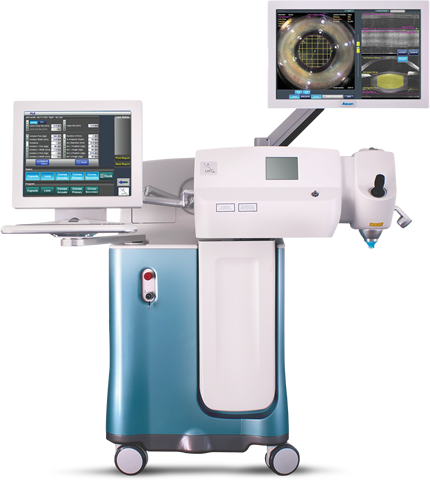 The Optiwave Refractive Analysis system (or ORA for short) allows for optical measurements to be taken during the surgery, after the cataract has been removed. In conjunction with pre-operative calculations done by Dr. Hamilton, the ORA system provides a very precise measure of the eye’s optics, allowing for improved accuracy of the lens power choice as well as for assessing the level of astigmatism. How does using ORA during the surgery benefit me? After the cataract has been removed, Dr. Hamilton will ask you to look at a flashing light. The ORA system will then take 40 optical measurements of the eye in 2 seconds. Advanced computer algorithms then display various power options to Dr. Hamilton. This allows him, together with his pre-operative measurements and years of experience, to make the optimal power choice for your eye. In addition to helping with IOL power selection, the ORA system assists Dr. Hamilton in treating your astigmatism. If your astigmatism is relatively low, Dr. Hamilton will have used the FLACS system to precisely place incisions at specific locations in the cornea. After analyzing the ORA results for astigmatism, Dr. Hamilton can decide if he needs additional astigmatism correction by opening the astigmatic incisions. Sometimes simply the placement of the laser incisions, without opening them, is sufficient to correct the astigmatism and they do not have to be opened. By using the ORA system, Dr. Hamilton can titrate his treatment and be more precise in reducing your astigmatism. 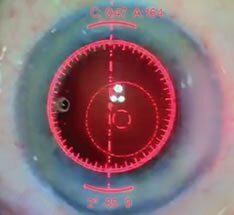 If you have a higher amount of astigmatism and Dr. Hamilton has elected to implant a Toric IOL, The ORA system will display an overlay through the microscope, showing real-time measurements of the astigmatism. As Dr. Hamilton rotates the Toric IOL into position, the ORA system assists him in placing the Toric in the precise orientation to maximally reduce your astigmatism. Because Toric lenses are extremely sensitive to small amounts of misalignment, the visual aid assists Dr. Rex Hamilton in making the most of the lens’s capability. Likewise, the ORA also provides an interface for patients who are having an astigmatic keratotomy.